Work by Elizabeth Scorsello from the first Malden Pops Up, held last year. Do you dread holiday shopping? 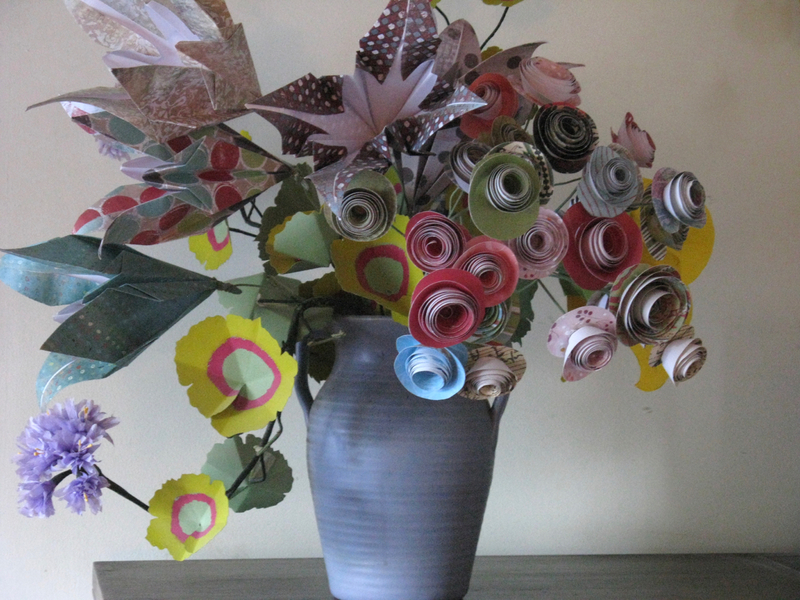 Do you have trouble finding a special gift amid the mass market clutter? Malden Pops Up is coming to the rescue. 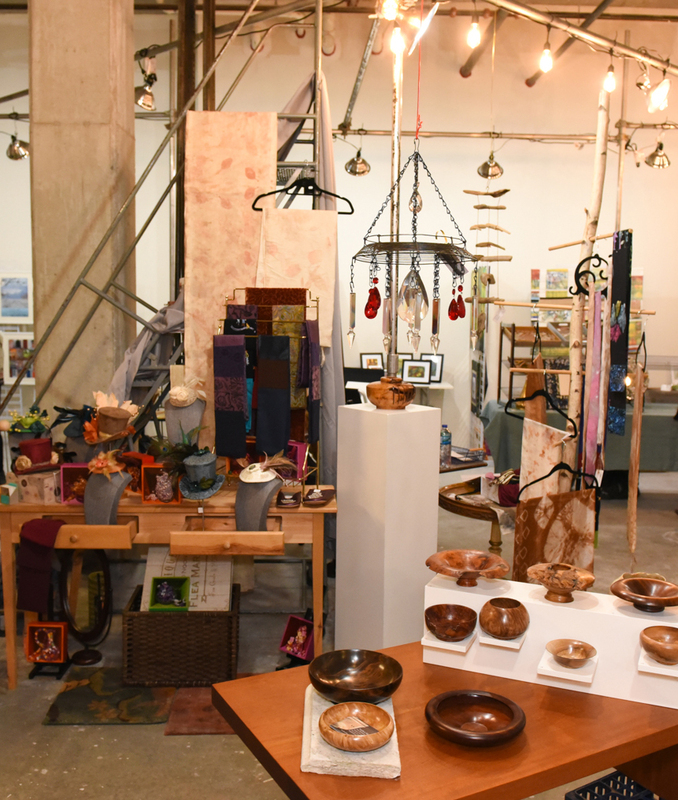 Malden Pops Up is a temporary gallery gift shop featuring unique wares by local artisans. It will spring to life on Nov. 16 in an empty storefront at 480 Main St., Malden, and run through Dec. 24. Even your fussy sister will be mesmerized by the selection of paintings, jewelry, photography, textiles, ceramics, glass, carved wood, sculpture, CDs, cards and books. The experience will be enriched by musical and spoken word performances, presentations and special receptions. New this year will be a children’s art corner, where young artists can sell their work and sit down to create things while Mom or Dad enjoy shopping. Performers and artists will highlight Malden Pops Up. Shown here are Ming Huang Zhang, artist, (right) and Erica Leigh, singer songwriter, from 2016. Photo by Ose Schwab. 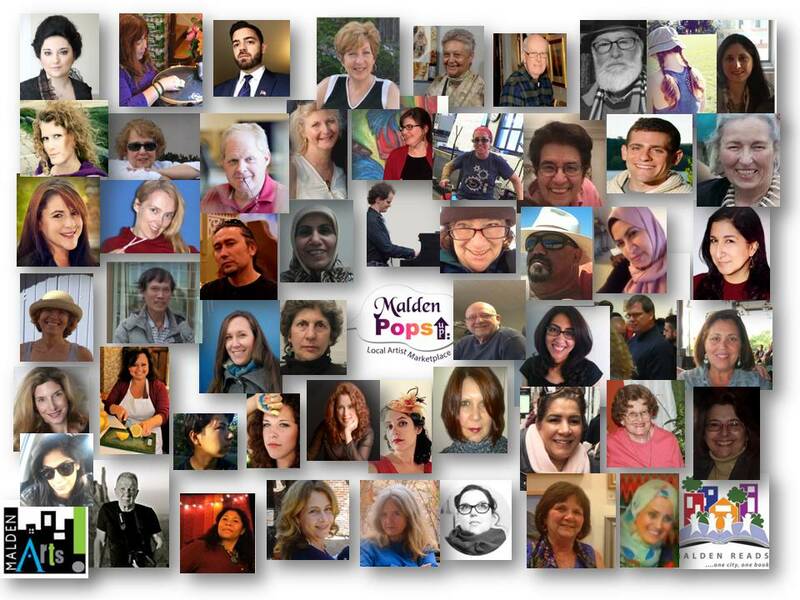 The inaugural Malden Pops Up was held in 2016 and represented 55 artisans from 12 countries, 84% of whom were local. In only 11 days, the store grossed $15,000 in sales, an impressive result. Schwab believes the shop showed Malden the power of community and art. With an anticipated run of 28 days this year, better marketing outreach and more special events, Schwab anticipates the store will be even more successful and exciting. The payoff of last year’s intense project was that “we were able to accomplish something very profound in a short period of time. There was a spark of enthusiasm that spread like wildfire.” Schwab said. “All the collaborators, including city leaders, were so excited. People really worked hard to do their part. That spirit of collaboration and good will sort of permeated everyone who participated, including the artists, the volunteers, and the people who came in.” The pop up created a true town square marketplace where neighbors gathered and bonds were forged. In addition, Schwab was delighted with last year’s collection of art, with rich colors and textures, which resulted in a stunning display and enticing atmosphere. This year “we look forward to five weeks of magic with you,” she said. 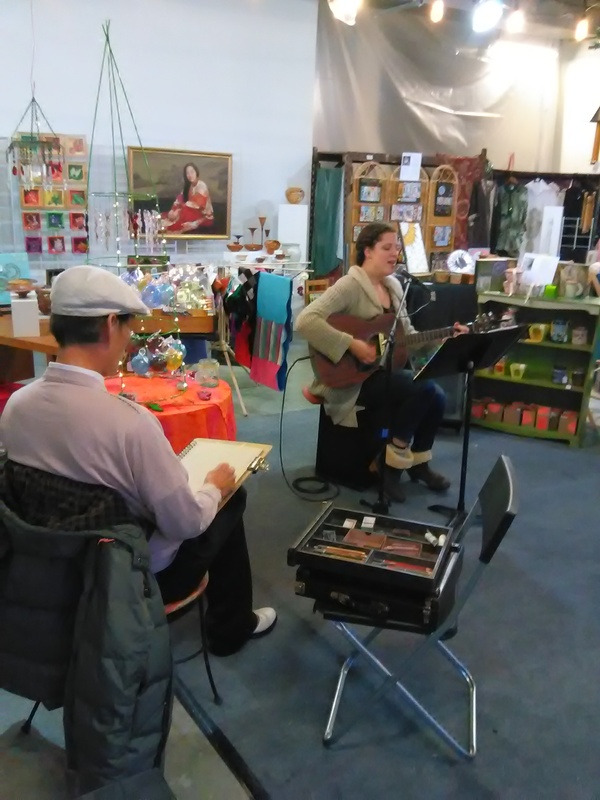 Artists with diverse backgrounds contributed to last year’s pop up with a remarkable variety of products, but they seemed to come away with two common conclusions: the experience gave them a new sense of connection and community, and the store was a welcomed addition to the shopping opportunities in Malden. 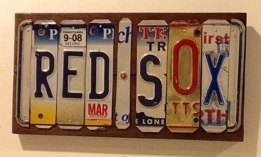 One of Glen Kruse’s hand-made license plates. Glenn Kruse of Melrose, who exhibited at last year’s pop up, did not set out to be an artist. As an electrician for 45 years, he collected license plates. Five years ago his children built a tree fort in the back yard and he decided to make name plates for each child to decorate it. People noticed them and began to request their own. His early creations were fairly crude but he has since purchased the proper tools and refined his techniques. Much of his work is by commission, and after 400-500 pieces, he has fabricated name plates that range from “Japan” to “London” to “New York City.” “I’ve sold lots of ‘Red Sox,’” he added. By contrast, Catalina Moreno started creating artwork as a young child. Growing up in the mountains in her native Colombia, she was constantly inspired by nature and still is today. Her work, which she displayed at last year’s pop up, includes paintings, jewelry, and glass mosaics. 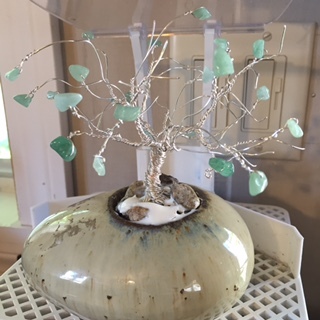 A “tree” crafted by Catalina Moreno. Moreno’s motivation comes from within. “I create because I feel a need to create,” she said. “It’s like a stress relief. I feel compelled to do something. I do art because I love art.” Nonetheless, she is fascinated by how people react to her work. “The way to grow as an artist is to listen to other people’s critique.” One of her best critics is her artistic 10-year-old son, who is already taking art classes at the MFA. 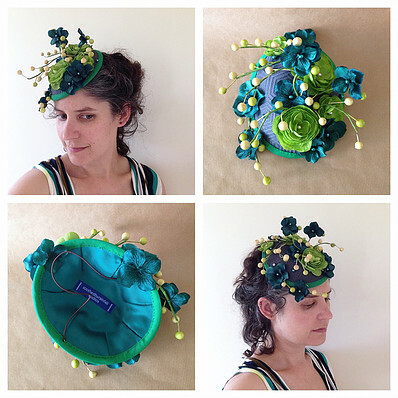 “Fascinators” created by local artist Paige Wallis. Mary Cacciatore concurred with the desire for affordability. She is not an artist; she simply happened to stop in to shop last year. She bought photography cards—and in hindsight wishes she had purchased more—but didn’t because she found the merchandise to be a bit pricey for gifts. She was, however, grateful for the opportunity to shop locally. Elizabeth Scorsello agrees that the best part about last year’s pop up was meeting fellow artists and making new artist friends. “It was a group effort, such a shared exchange, everyone working together,” she said. “I loved the spirit of it; everyone was elated!” She noted that even city officials joined in, from offers of assistance from the Mayor’s office to visits from city councillors. She is delighted that she can finally buy handcrafted gifts in Malden. “I don’t have to go to Cambridge to buy good stuff.” She did well last year and hopes to repeat this year. So mark your calendars. Malden Pops Up: Where Local = Global will open on Nov. 16 at 6 p.m. with a grand ribbon-cutting and celebration. Mosaic crafts by Lori Manfra. Malden Pops Up is an immense collaborative effort among artisans, performers, local businesses, volunteers and the city of Malden. If you’d like to get involved, see http://maldencreates.com/maldenpopsup/ or contact Ose Schwab, maldenpopsup@gmail.com, 781-480-3214. Volunteers are needed for numerous functions; those with marketing interest and experience are especially needed. Applications are currently available on the website for artisans and performers. Robin Inman is a member of the Malden Pops Up committee and a newly trained citizen journalist for Neighborhood View.